Talleen with Gelli workshop participants. 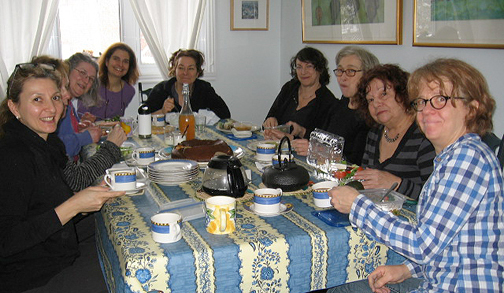 On Saturday March 22, eight artists braved yet another Montreal snowstorm to attend my Gelli Monotype workshop in my private studio. The warm ambiance and burst of color that followed alleviated weather related woes. 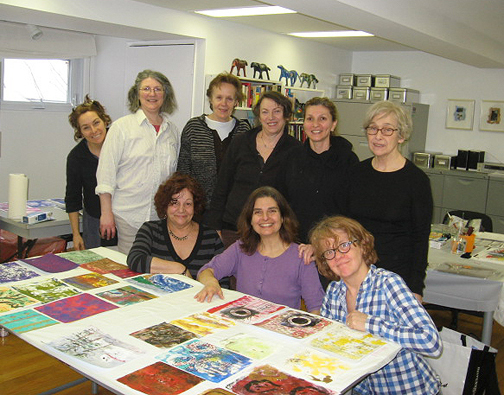 An all woman power team of professional artists, school teachers, translators and a program designer spent the day exploring the magic of Gelli printing. After a slideshow of various Gelli artists, followed by a look at my own original Gelli prints we got to the serious business of creating art. My studio felt ergonomic and functional. Students had ample room to work on two tables. We had a station for tools, another for paper, and a table for drying and displaying prints. Print by Zaynab Touqmachi with the foam stamps she made. 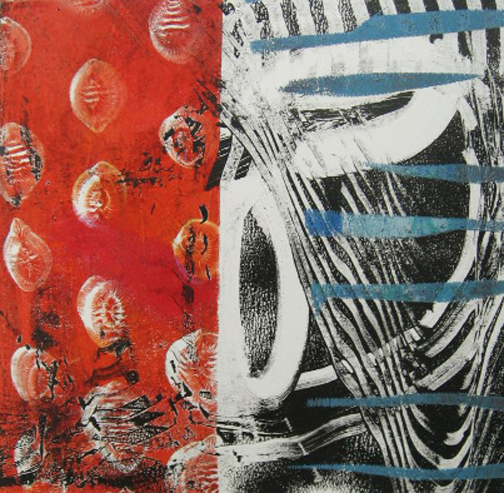 Although Gelli printing is straightforward, its endless possibilities make it a challenge to teach. I guided the group through a series of structured exercises, gradually leaving more room for personal exploration. 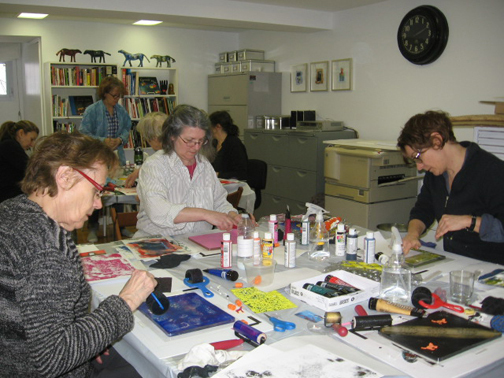 While I demonstrated, participants created very small Gelli prints, using various tools such as rubbing plates, rubber stamps, combs, bubble wrap, Q-tips and credit cards. They learned the basics of overprinting and masking. Working on 8 x 10 inch Gelli plates, provided the convenient option of working on smaller bleed formats. 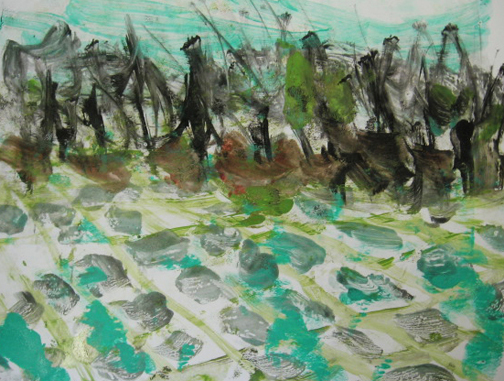 After commenting on the ensemble of work, students experimented on larger formats with the techniques they had just learned. 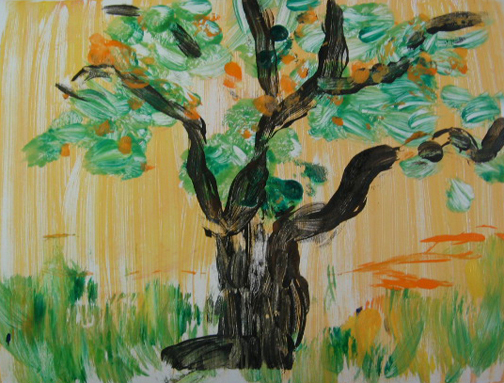 They quickly grasped a feel for the medium and eased into the mode of intuitive image making. Lunchtime was a jovial affair. My mother brought a homemade marble cake and served us tea and coffee, while Renée treated us to a bottle of her refreshing homemade fruit kefir. 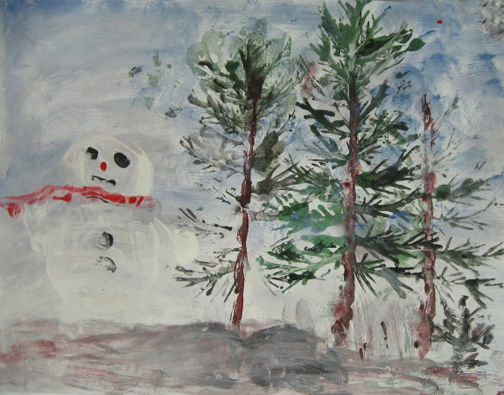 The dining room table was abuzz with chatter and questions about my artwork on the walls. 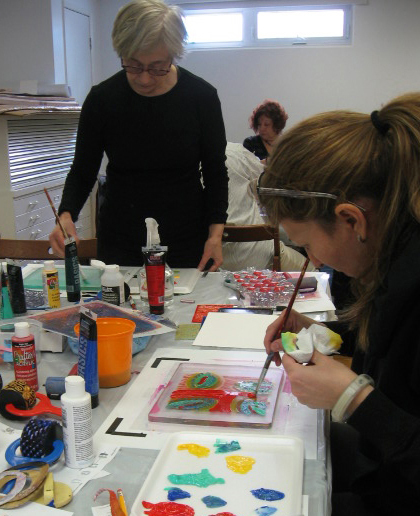 In the afternoon we explored stenciling and brushwork, working on the entire surface of the Gelli plate. 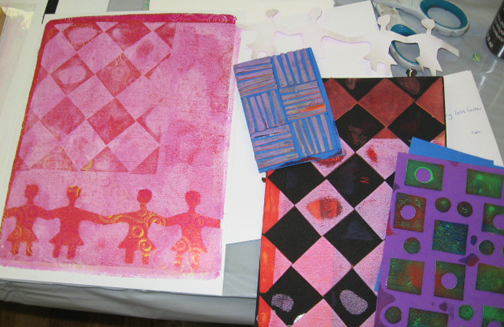 I ended by showing how I trim my Gelli prints with the paper cutter and mount them onto quality art paper. 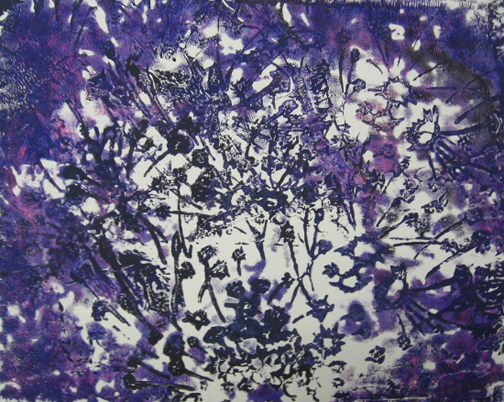 Professional printmakers were happy to have discovered a printmaking technique that they can practice at home. Teachers were excited to integrate the technique into their educational programs. Everyone was satisfied with their work. By the end of the day the storm had subsided. Everyone left with their new prints, leaving a trail of footprints in the snow and a warm feeling in our hearts. 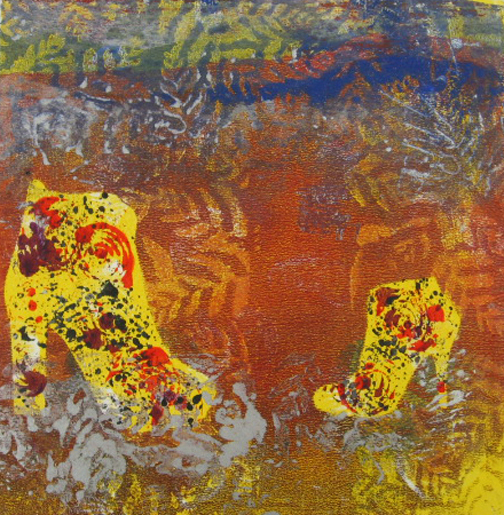 Please check out the dates of my next Gelli Monotype workshop in the “COURS” section of this blog. 17 requêtes. 0, 145 secondes.